A Carl Whitcomb introduction which was originally marketed as Firecracker Crapemyrtle and has currant or light red flowers. Flower buds are crimson before opening and the flowers may have some white petals, especially on cool cloudy days. 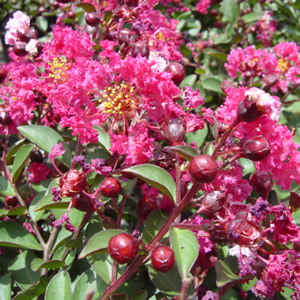 Tightwad Red® Crapemyrtle will bloom in July and sporadically afterward until frost. The new foliage growth is wine-red, then purple-green, and eventually dark green later in the season. Lagerstroemia indica ‘Whit V’ branches prolifically to produce a small mound, similar to dwarf yaupon. This cultivar is highly resistant to powdery mildew and has some drought tolerance. For more information on this product and other Whitcomb introductions go to www.lacebarkinc.com.